Human SIRP alpha, Mouse IgG1 Fc Tag (HPLC-verified) (SIA-H52A8) is expressed from human 293 cells (HEK293). It contains AA Glu 31 - Arg 370 (Accession # NP_001035111). This protein carries a mouse IgG1 Fc tag at the C-terminus, and has a calculated MW of 63.5 kDa. The predicted N-terminus is Glu 31. The reducing (R) protein migrates as 70-105 kDa in SDS-PAGE due to glycosylation. 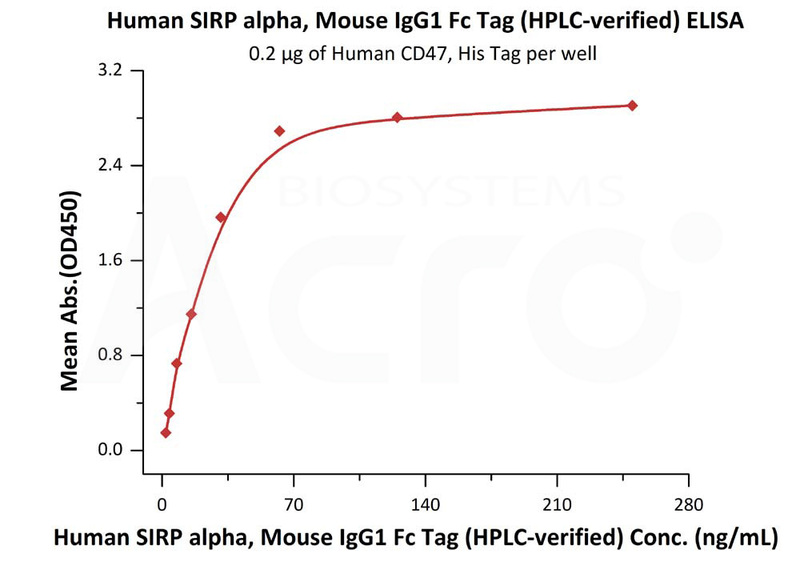 Human SIRP alpha, Mouse IgG1 Fc Tag (HPLC-verified) on SDS-PAGE under reducing (R) condition. The gel was stained overnight with Coomassie Blue. The purity of the protein is greater than 95%. 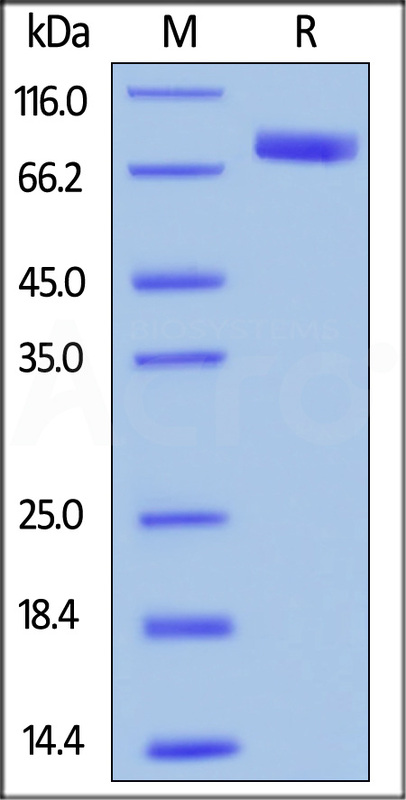 The purity of Human SIRP alpha, Mouse IgG1 Fc Tag (HPLC-verified) (Cat. No. SIA-H52A8) was greater than 90% as determined by SEC-HPLC. Immobilized Human CD47, His Tag (Cat. No. 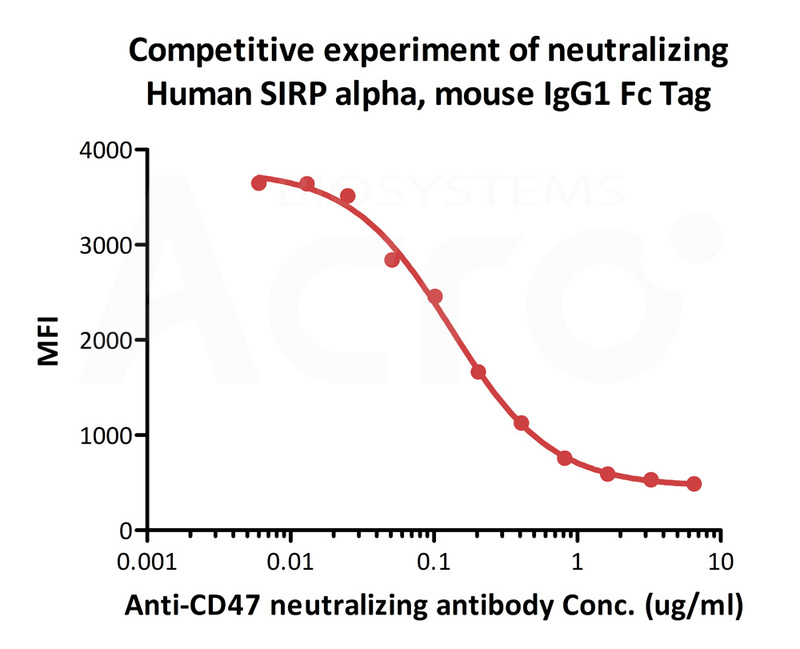 CD7-H5227) at 2 μg/mL can bind Human SIRP alpha, Mouse IgG1 Fc Tag (HPLC-verified) (Cat. No. SIA-H52A8) with a linear range of 8-250 ng/mL (QC tested). FACS assay shows that recombinant Human SIRP alpha, mouse IgG1 Fc Tag (HPLC-verified) (Cat. No. SIA-H52A8) can bind to Jurkat cell expressing CD47. The concentration of SIRP alpha used is 0.3 μg/ml (Routinely tested). 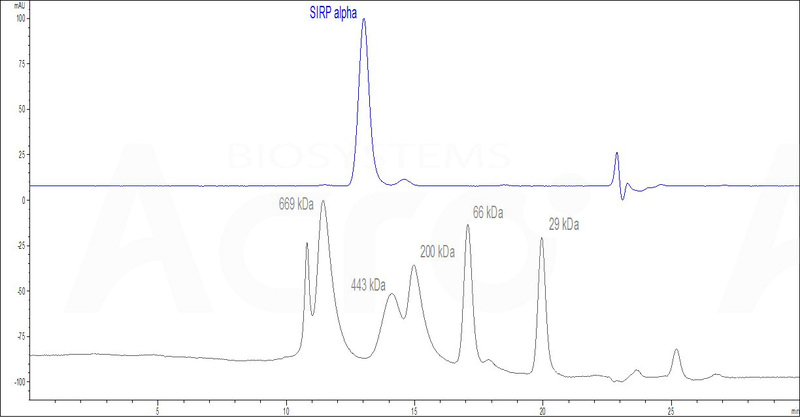 FACS analysis shows that the binding of Human SIRP alpha, mouse IgG1 Fc Tag (HPLC-verified) (Cat. No. 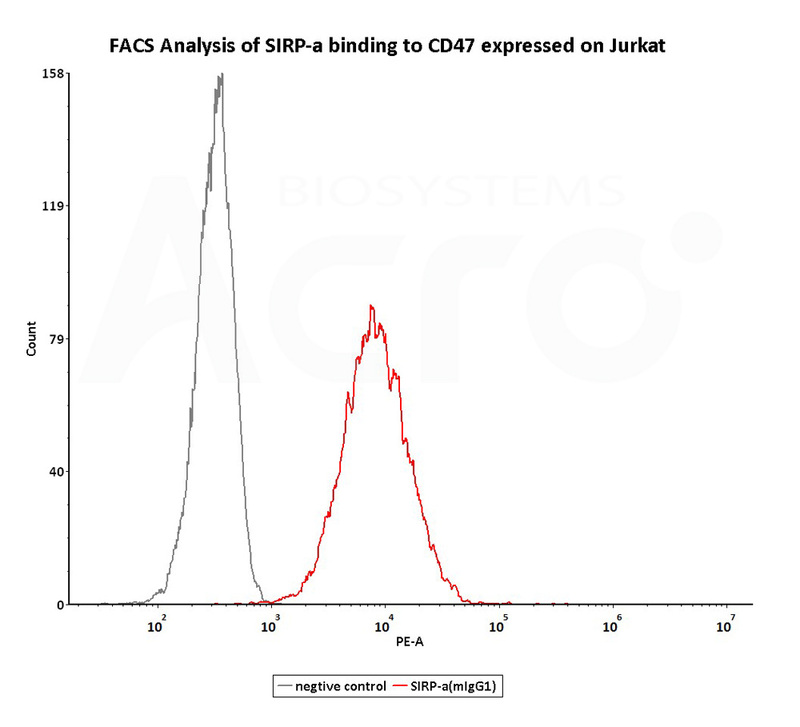 SIA-H52A8) to Jurkat expressing CD47 was inhibited by increasing concentration of neutralizing anti-CD47 antibody. The concentration of SIRP alpha used is 0.3 μg/ml. IC50=0.1318 μg/ml (Routinely tested). Tyrosine-protein phosphatase non-receptor type substrate 1 (SHPS1) is also known as CD172 antigen-like family member A (CD172a), Macrophage fusion receptor, MyD-1 antigen, Signal-regulatory protein alpha (SIRPA or SIRP alpha) or p84, is a member of the SIRP family, and also belongs to the immunoglobulin superfamily. SIRP alpha is Ubiquitous and highly expressed in brain. SIRPA / CD172a is immunoglobulin-like cell surface receptor for CD47 and acts as docking protein and induces translocation of PTPN6, PTPN11 and other binding partners from the cytosol to the plasma membrane. SIRPA / SHPS-1 supports adhesion of cerebellar neurons, neurite outgrowth and glial cell attachment and may play a key role in intracellular signaling during synaptogenesis and in synaptic function By similarity. SIRPA / MyD1 involved in the negative regulation of receptor tyrosine kinase-coupled cellular responses induced by cell adhesion, growth factors or insulin and mediates negative regulation of phagocytosis, mast cell activation and dendritic cell activation. CD47 binding prevents maturation of immature dendritic cells and inhibits cytokine production by mature dendritic cells. (1) Timms J.F., et al., 1999, Curr. Biol. 9:927-930. (2) Stofega M.R., et al., 2000, J. Biol. Chem. 275:28222-28229. (3) Latour S., et al., 2001, J. Immunol. 167:2547-2554.